My hunter was equipped with an Axe, 15 arrows, 2 traps and a bow. Aurelia has a mana and healing potion and a knife. How can I use these resources to turn the battle? Set traps, heal my healer and a healed mage helps the melee fighter. Your witch can alternate between being a spell and melee fighting [as she hits hard] and healing. Can I use the terrain in the Lysander Lice Quest to my advantage? Yes. The quest for 5 lice is near complete by using a choke point. You will note that there’s some fallen rocks which is about as far as your character may travel to on the first go. Before entering the fight equip your main PC with a melee weapon. 95% of this battle is close quarters. My hunter bow misses more times than it hits at short distance. Move the characters so they are on the two squares of the choke point. You may now be attacked by a maximum of 3 lice at a time – not surrounded and taking a bashing from 6 lice. You’ve reduced the threat by 65%. Each PC may only be attacked by a maximum of 2 lice. Rather than using a bow, I set a poison trap on the middle hex [in front of my main PC] of the three vacant hexes in front of my PC. This means one louse will have less HP and may be killed off easier by either of your PCs. Aurelia ought to finish the wounded lice off with a good stabbing. Using this choke point you are probably down on mana, a little heath but you have easily racked up 5 dead lice. Hurrah. Open that beer as we have done the hardest part. Ready yourself for the “5 Lice” escape. The lice in the upper part of the screen ought not to have moved. Note: There are enough of them to block and surround one PC. The other PC may flee with more or less impunity. I got surrounded by lice. I hacked and slew one, walked through their carcass and fled to the exit. I had one PC who could easily flee. The other PC was always caught in melee. Recommended action: Hack at one louse with lowest HP and who is nearest the direction exit to the level. Note: At this point the lice may easily surround and kill you both off. Remember you just need to escape now. No heroics. See the exit and leave. Hint: To escape the map – your PCs need to be standing on the exit hexes. Press V a few times when you think you’re near the exit to escape and make sure your character is on the yellow exit hexes. You should easily complete this level with a fighter PC. It’s doable with a hunter. I’ve not done this with a mage and a witch. If you have a mage and a witch I refer you back to the opening paragraph that suggests know the terrain, know your characters and act! I hope you can complete this level faster and easier. I thought this flashback added nothing to the game and is frustrating. This level revises the basics of winning the game. If this walk-through of Blackguards Chapter 3 – Lysander’s 5 Lice Challenge was helpful, please bookmark and comment! This level is particularly hard. A battle is won if you know the terrain and to revise what your characters are carrying. I will give advice how I approached this. Strategy overview for Final 9 Hoards level. The strategy is to keep Aurelia alive, stop the lice from re-spawning from their drain lairs and to keep player characters on the move, close the drains in sequence and make the lice kill themselves. Your mage is key to winning this battle. You have to protect the mage and use astral potions wisely. Remember that Takate‘s belt has four slots. Swap the belt from Takate and give to your mage. The trade off is that Takate will not be using thrown attacks with axes and javelins. This doesn’t matter so much on this level using my strategy below. If you swap over the belt, your mage will now have a LOT of extra mana to heal, buff your warriors and to spell cast / destroy lice. I equipped three potions plus one health potion [as the mage always seems to fail due to concentration issues LOL]. It is similar to the previous 2 quests to protect Aurelia that you have already completed :-D.
You will note there are acid rivers dotted all around the map. Players can walk through this with ease and I had not noticed any damage to my players. I did not see the battle log to see if there was a low level role which I had passed. Once the lice walk through the acid, you will note that they start to ‘steam’*. Once the lice start to steam, there is a 3 turn countdown before they explode. If new lice appear from the drains just lure them through the acid and run away. Make sure your running man does not get surrounded on all sides while closing the drains. What I did was to make my way to a drain and if I was going to get surrounded or the lice were going to blow up was to make a circle around the drain. For the first few rounds, I sent up two characters, one to the left, the other to right. I sent up my main PC [hunter] and one fighter [dwarf]. I used one of my fastest players to speed around and to shut the drains [my main PC is a hunter]. After closing the left hand drain, withdraw one fighter [dwarf] to support the mage and engage the Queen. You need to keep at least one fighter and the mage near Aurelia to take on the Queen and to buff / heal. I lured the Queen louse to the left, closest to a drain I had previously shut, while my drain runner hunter was closing the drains in an anti clockwise fashion. He can then lure the lice to him. Near the end of the battle, if needed, this runner can heal at the fountain on the far left of the map his job is mainly to keep lice away from the main fray. The queen fight is reasonably hard, however I buffed a fighter with a higher AC and kept on healing both the fighters and Aurelia. I also had learned dodge 2 and had my Dwarf with a shield, in full gladiator set armour and Naurim’s axe equipped. This fight is VERY easy if you protect your mage and use the extra slotted belt with mana. Note: Your warriors can survive one or two explosions from the exploding lice. If this looks likely try to take out a louse with ranged / magic of one of the lice that will reach you and will blow up. If you kill a louse which is steaming it won’t blow up. This is handy to know when killing lice which are attacking Aurelia. Remember, lice which have been in contact with the acid blow up after 3 turns. *I’m guessing the acid on the ground is some form of aqueous sodium hydroxide which does not affect the player characters. Good luck, I hope this helps you! Please leave a comment if it did :-D.
Recently I installed McAfee’s internet security with BT Internet, using their BT Infinity package. Shortly afterwards I noted that the Airplay Icon that was in the icon bar and now you cannot see it. Here’s a step by step guide to resolve connectivity issues if you have just got Apple TV out of the box using a Mac, and using BT Infinity with McAfee to the more advanced situation [like mine] if you’ve just loaded on McAfee and then could not use Airplay with Apple TV and your Apple TV was streaming perfectly beforehand. If you’re a new user and have the Apple TV out of the box and wondering how to get started then follow the steps from Stage 1 to 3. If you have set up Apple TV before and if you cannot get the icon to show in the menu bar and have just installed McAfee then jump to stage 3 below. I do recommend that you double check stages 1-2. On your TV turn on the Apple TV box [white light is showing]. The other options in this section I’ll jump. You may read elsewhere about them. Just make sure that the airplay speakers are what you want. I choose the television’s own, otherwise you’ll have the sound blasting from your Mac and not your television :-D.
You can use AirPlay to play music or other audio content on the Apple TV on other AirPlay speakers. Select Settings > AirPlay > [Select the desired AirPlay speaker].There are more options in this stage but this is a quick fix guide to get you going using minimalist steps! Hint: there only is one option unless you live in a household with more than one Apple TV on the local network]. 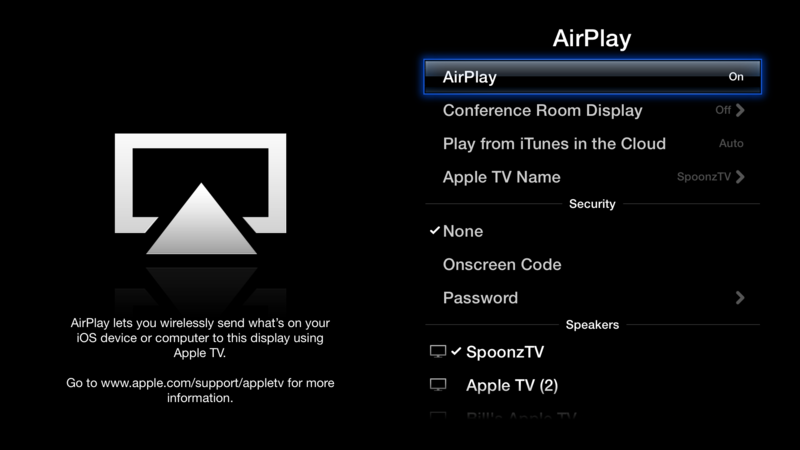 It’s the same with Mountain Lion – just select AirPlay mirroring. This part is simple. You just want to turn off the firewall from McAfee. Apple has its own firewall anyway so you’re adding on another layer of security which you don’t really need. Click the general button from the top bar [first on the left] it ought to be the default button unless you had it open before. Turn the firewall off by pressing the off button [see screenshot]. You may have to authenticate the change by typing in your Apple ID password. Click lock to prevent further changes [best policy]. Wait a few seconds [normally 20-30] and the blue light / blacked out showing Apple Airplay is now working.If it’s blue, then that’s because the Apple TV console is on, if black then Airplay is active but the Apple TV box isn’t presently on. You will have the annoying McAfee icon which says there’s something wrong. You can’t get rid of this sorry! Yes, we know that the McAfee firewall is off, but Apple has its own firewall. Make sure that’s turned on! Enjoy movies, TV and music on your Mac with McAfee‘s internet security. Please comment and say thanks if my guide helped you fix the connection problems with getting Airplay working on a Mac using McAfee. I love using Looperman and other sources to find loops that I need to use in GarageBand. My friend Brillstereodeck also creates loops and I needed a way to easily import these into Garageband without any hassles. 4. New tab opens, with import settings. 1. Open iTunes and the folder with your .wavs. 7. Voila let the files convert. I normally trash the .wavs after. I recently had a problem with T-mobile. Simply I wanted to change tariff and to get my user-password reset. I tried calling 150 and its impossible to find a route to speak to someone. Back in 2006, T-mobile impressed me. They had a great customer service. I would call 150 and speak to someone within a few seconds. The only effective way to contact T-mobile is via their Facebook page. They are reasonably quick to answer your replies. I resolved my query in 2 days. That was more my fault than theirs. I did however get what I wanted and I have to say they were helpful. I did ask them to contact me by phone, but they did not do this. I think if you have a serious issue you may wish to consider the alternatives. Which are pay 25 pence a minute to speak to someone. This I believe if you wish to cancel a contract with them is a big blow beneath the belt. It’s very implausible that a mobile phone company refuses to speak via ‘phone to its consumers. As a consumer, I recommend you go to a T-mobile or EE shop and get resolution there. Realistically it is your only channel. The only other way to get satisfaction is to complain to trading standards or Ofcom as I believe their ‘phone based customer service stone-walling and then diverting calls to a premium help-line just shows how bad their service looks. Thankfully I am on a PAYG contract. Converting to a monthly contract, for I, is now off the table. T-mobile appears not to care about customer service. I refuse to conjoin with a company that does not offer any client facing support. Recently I went to an Apple store and I found out that if you buy a new Mac you get iWork for free. Hurrah! If you had the older version, you had to pay. Boooooo! I wondered if there was a work around to get it working on older Macs [using] OS Mavericks. There is. Plus you don’t need to have updated to Mavericks either. In essence you need to get a Trial version of iWorks ’09 and then just update the software. You will need to get a trial copy of iWorks ’09. There’s a lot trusted sources to get the program. I recommend techweek europe’s link. Click the link and download. Before you open the .dmg file, make sure your Mac can open downloads from third party sites. In the top menu bar click the apple icon. Click System Preferences then Security then General. Select allow apps downloaded from Anywhere. Locate the downloads file on your Mac. Double-click Install iWork ’09 Trial. Open one of the apps, I used Keynote. A message will come up saying there’s a newer version of this application would you like to update. Press I agree / Confirm. The App Store application will open. Pages, Numbers and Keynote will be showing somewhere near the top of the list. Just click UPDATE on the right hand side to update the programs. Note: The trial version of iWork 09 will remain in your Applications file and it will repeatedly ask you to register. The latest versions of the iWorks apps will be located OUTSIDE the iWork ’09 folder. Make these your shortcuts in your dock menu and any other short cut bars and NOT the iWorks 09 apps. I dragged and dropped mine to my dock. Notice: I already have bought Keynote and Pages for my iPad, and Keynote for my Mac. I felt a little let down by Apple who ought to have let anyone who updates to OS Mavericks have this incentive. Where has Apple’s Special Deals & Refurbished iMacs, iPads, Laptops gone? After the recent launch in October 2013 of the new retina 5c iPhones, iPad 4’s and iMacs, Macbook airs etc etc… the refurbished store from Apple is quite hard to locate. After a few searches I came up with nothing. Here’s a way to go direct to the refurbished Apple Products store for any country. Note: All the URLS for the Apple Store are in English. Below you will find the link you need. Change the two characters in bold for your country’s domain suffixes initials. Hint: uk = UK, us = USA, de = germany, es = Spain etc. fr = France. Note: The only country which this does not follow is .com for North America. Best of luck. If you liked the story, please let me know! Where is the Hash # Key on a Mac Keyboard? This morning I surprised myself as I had forgotten where the # hash key was on a mac keyboard. I’m presently using the US Keyboard with the UK set up. The hash key is often labeled on many keyboards, but the short-cut isn’t that easy to locate. Instead of pressing SHIFT + 3, press ALT + 3 to insert a # hash symbol into your text. This will work with all versions of Mac OS X using the US and UK keyboard layout. iTunes has a huge library of photos even for rare indie and abstract artists. But, it don’t have them all. This is why you need to know how to add your own album covers to iTunes. In addition, if you are an artist you might want to add your own album cover to your music. Here’s how to add artwork album covers to iTunes. 1. When you open iTunes it ought to have pre-selected what you need. If not, then click MUSIC from the left hand menu and ALBUMS from the middle menu.Browse view, select the album in your iTunes. 2. Then select the album and either right click and press GET INFO or use the keyboard commands: Command-I for the Mac or Ctrl-I for the PC. For albums with more than one song you will see the following warning. Press YES and continue. 4. Under the INFO tag [far left in the MULTIPLE ITEMS INFORMATION SCREEN] view the Artwork field by selecting its check box. Artwork is in the right hand panel, just below BPM. 5. Drag and drop the artwork file into the Artwork panel and CLICK CHECK the box. 6. Click OK to save and make the changes. 7. Press OKAY and the album cover automatically updates in iTunes. That’s it. The artwork for the entire album will show on your iPad / iPod and in any screen savers using the program! If this helped you, please leave a message. This information was correct as of October 10, 2013. Spanish Autonomos, freelancers & corporates have just 1 year Apple warranty – not 2 like consumers. I love Apple products and services. I think their service is top notch and if you are lucky to live in a city with an Apple store, then you can just drop in your equipment and get it fixed or looked at. I had recently had an eye opener as I found out you only get one year’s warranty in Spain on an Apple device. It’s strange as a consumer gets 24 months warranty. I will offer you a better solution to fixing your iPad with Apple that could extend the life of the device and potentially your investment. If you are reading this and have bought a device with your tax number then sadly you are in the same boat. When I bought the item I was not told that you only had 1 year warranty. Bad Apple. Now looking back at it, I wished I had opted for the Apple care. So, if you have not bought yet, I recommend getting it. Over the years, my iPad 2 has had many problems. As you will find out, getting an iPad 2 with 3G repaired is very expensive. My problem was that the SIM card reader had died. What did I do to verify the problem? I had duplicated the SIM card, had the device checked for errors, reset the device to factory setting but the problem continued. The fault was with Apple and the cost of repair was on me. It was going to cost me around 250 euros to get just the SIM card reader repaired. I had a small scratch and some corrosion on the back of the device. Otherwise it functioned perfectly. In all honesty, I think Apple’s repair costs are excessive. There were other Apple official dealers which charged a lot less for the parts and service. They charged around 70 euros. However, I did some research and got another solution which in some respects is better. I looked on the net, called Apple and I found that the best solution is to ask for a direct one for one replacement of the device. The result, I got a gleamy refurbished model with stiffer buttons, no blemishes nor scratches. The strangest thing is it costed LESS than the repair of just the SIM card reader. What do you do to do this? You just take device in to a store, hand over the old, pay up and get the refurbished one. You don’t need your box or charger. It’s best you take the receipt if you have it. The coolest thing about Apple is that they will print out your receipt. This is one of the biggest differences and I guess this is how they justify their pricing. For me getting it changed worked out cheaper than buying a new device (iPad v3 or iPad mini) and I would have had to have paid more if I recycled or it part exchanged it to get a new one. I’m happier as you get 3 months warranty and if you had some blemishes and a few scratches and the push button (control) is a bit beaten up it could save you problems in the future. I saw it as a safer investment. In conclusion, be careful buying Apple products for business in Spain. You only get 12 months warranty. I highly recommend to buy Apple care when you buy the device. To end my story, I know there’s no retina display or Siri but now I have a swanky looking iPad again. If in doubt about the warranty for your device use the link below.